Recovery is kind of a dirty word to runners. What do you mean you want me to rest? Can I go for a short run? Please don’t make me take a whole day off!! Stretching? Rolling? Yoga? That will all cut into my running time! 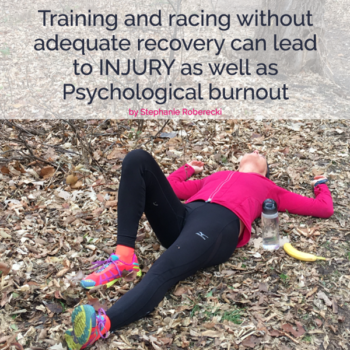 Training and racing without adequate recovery can lead to INJURY as well as Psychological burnout. Every intense workout MUST be followed by a recovery period. Our bodies need time to repair the muscles, joints and tissues after an intense workout. Ingesting carbohydrates post exercise can enhance muscle glycogen synthesis. Ingesting protein may increase muscle protein synthesis. After a great race you want to keep building and capitalizing on your accomplishment! After a bad race you want revenge and have unfinished business. Hydrate with 500-1000 ml of water and electrolytes. Fuel with carbohydrates 1.5 grams/kg of body weight. Stretch, foam roll, keep moving! Recommend 7-10 days of NO RUNNING followed by 2 weeks of light training. Focus on cycling, yoga, stretching, Pilates, foam rolling, Aquatic exercises. Recovery time can be associated with finish time/experience. The more half marathons you have run the less recovery you may require. 2-4 days is recommended with less days required if run at less intensity. General rule of thumb: wait 1 day for each mile raced hard before doing SPEED work. 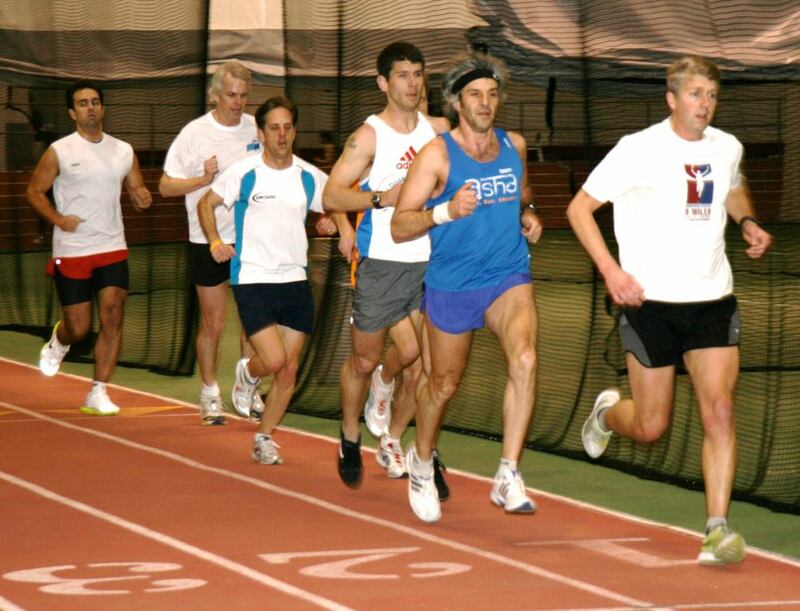 Even the ELITE runners take 7-10 days off 1-2 times per year to allow for tissue healing and recovery. Recovery runs DO NOT actually aid in recovery! They DO NOT promote muscle tissue repair, glycogen replenishment, or any other physiological response that actually is relevant to muscle recovery. Injury PREVENTION is key in keeping runners like YOU happy! 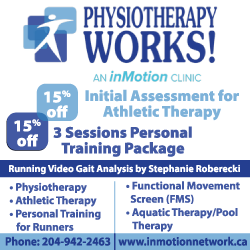 Incorporate proper recovery into your training and you and I will meet on the race course, not at Physiotherapy Works! Meet on the 2nd floor mezzanine level, outside the hockey rink by the glass doors. The goal of this event is to provide an opportunity to see our facility in action! Saturday’s are a busy day of training for all level of participants, so we’ll start above the crowd, where we can chat and provide some background information. We’ll point out coaches and at the end of the sessions you’ll have an opportunity to meet with them and discuss different training options. You will also have the opportunity to get active and participate in a group warm up and workout, led by some of our current Masters Athletes! Finally, Lou Billinkoff is going to be racing in an attempt to set a new Canadian record in the 50m and potentially break the World Indoor record! We have 10 lanes, so that means there are 9 open spots for anyone that wants to join him. Congratulations to Jonathan Torchia, Race Director of the WFPS Half Marathon, and his wife Robyn on the birth of their first child, Giacomo Greyson Torchia! The bouncing baby boy was born on October 24, 2018 and weighed in at 9lbs 6oz. How long before the little man is Co-Race Director and telling his Dad how things should be done?! Best wishes to Jonathan and Robyn! It is with sadness that I announce the passing of Ed Klassen on Sunday, October 21, 2018 at the age of 83. 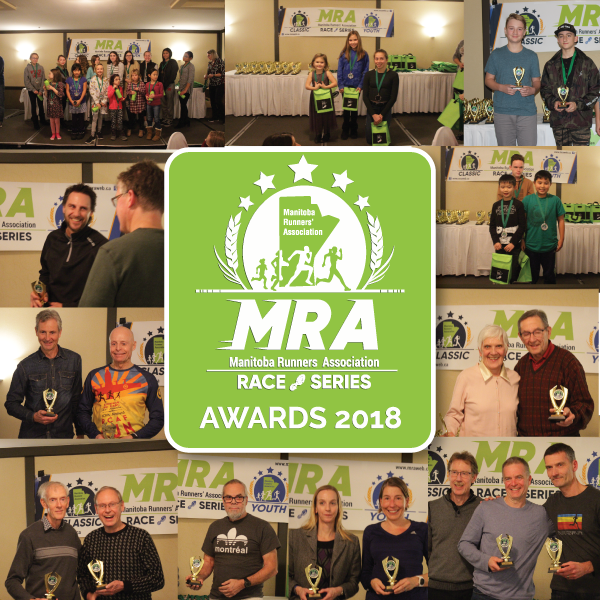 He was a long-time member of the Manitoba Runners’ Association and won many age group awards in the Timex Series in both the 70-74 and 75-79 age groups. He was a former World Masters Record Holder and enjoyed running to the very end. He will be buried with his running shoes and games medals. Funeral service will be celebrated at McIvor Avenue Mennonite Brethren Church, 200 McIvor Avenue, Winnipeg, on Friday, October 26, 2018 at 11:00 a.m. with interment in Glen Eden Memorial Gardens. 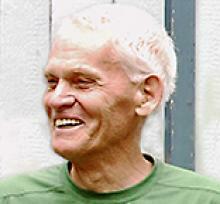 Those who so desire may make memorial donations in memory of Ed to CancerCare Manitoba Foundation. 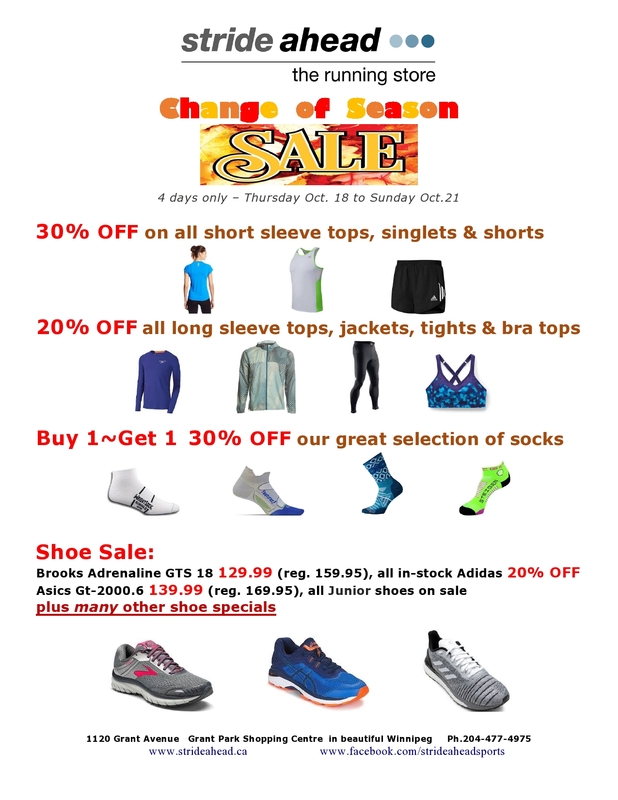 One of our sponsors, Stride Ahead, is having its annual Change of Season Sale! MRA members can enjoy savings on shoes, clothing and more. Visit the store at the Grant Park Shopping Centre between Thursday, October 18th and Sunday, October 21st. 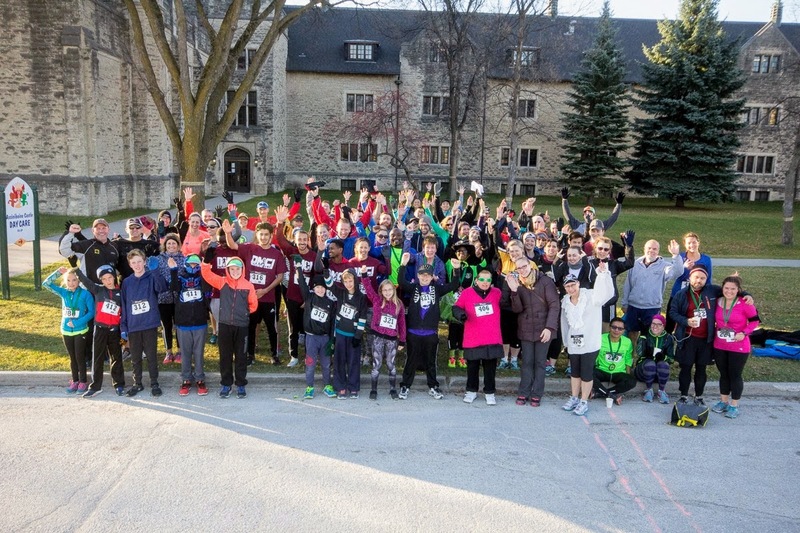 Time is Running Out to Register for Run 4 Your Cause! Thinking about participating in R4YC on Sunday October 21st? There’s the ever popular 5K Awesome Twosome or you could Tri3.3K. There’s still time register for either event, but this Thursday evening at midnight the entry fee increases, so don’t delay! More information about this unique event is available on our website. Or go directly to our online registration. See you on the 21st! Not able to make it? We have a virtual option available as well! Order your new MRA technical jacket now! Our good-looking and functional technical jackets are now available! These jackets are a steal at $95.00/jacket, taxes included. Below is a sizing chart for both male and female versions of this jacket as well as a link for the full description. They will be in the MRA colours of course-black and acid green. Please let me know by October 15th if you wish to order one (or more!) of these jackets and the size that you will require. Please ensure that you specify male or female sizing. Payment can be made by cash, cheque, etransfer or credit card. I can also accept debit card, but in person only at the MRA information table at the Linden Woods Fall Classic event on Sep 30th. You can also try on a jacket-I have both a mens medium and a ladies medium available. We have been promised about a 4 week turnaround so I’m hoping that the jackets will be ready to be picked up at our Awards Banquet on November 14th. Contact the MRA office at office@mraweb.ca or 204-477-5185 if you have any questions or wish to order. 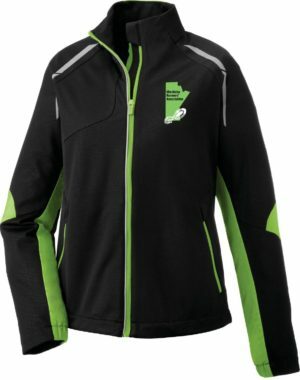 Show everyone your support of the MRA by wearing an MRA Technical Jacket! When it comes to rapid weight loss, there’s no shortage of fads and trends. Still, when body beautiful celebrities like Halle Berry and Gwyneth Paltrow admit to following the Keto (short for ketogenic) Diet, you have to wonder: What is it? The Keto Diet, or being in ketosis, is essentially where the body metabolizes fat as its primary fuel source. The easiest way to get into a state of ketosis is through fasting or high intensity training, since you need to deplete blood and liver glucose, as well as muscle glycogen. But you can also achieve it by switching to a high fat/moderate protein/low carbohydrate diet in which you’re training your body to burn fat for energy. The name basically refers to the fact that the body turns to ketone bodies, the main fuel source from the breakdown of fat, and that’s what the body eventually runs off-burning fat day and night. Not only does all that fat burning result in rapid trim-down for many, but it’s also said to make energy levels more stable than when the body burns carbs for energy. The Keto Diet is also shown to help with diabetes and mental focus. There are numerous therapeutic benefits of the Keto Diet; from treating diabetes to helping manage epilepsy. People experience better mental clarity and focus as well. Halle Berry reportedly uses the low-carb diet to help manage her type 2 diabetes, and credits it with helping her lose her baby belly, keeping youthful and improving her physical and mental performance. Basketball star LeBron James, too, reportedly credited his rapid weight loss to a similar diet, which included eliminating sugar and dairy. But how does a non-celebrity without a team behind them make it happen? The results sound amazing, but the idea of cutting out carbs is daunting for many. As people make the switch from «sugar burner» to ketosis, they might feel unwell and light headed, as their bodies switch fuel sources. It’s a struggle for many people. But give it some time and the right strategies and the Keto Diet can actually help improve your performance, both physically and cognitively. The key to success is to go about it healthfully, and that includes stocking up on the right tools. 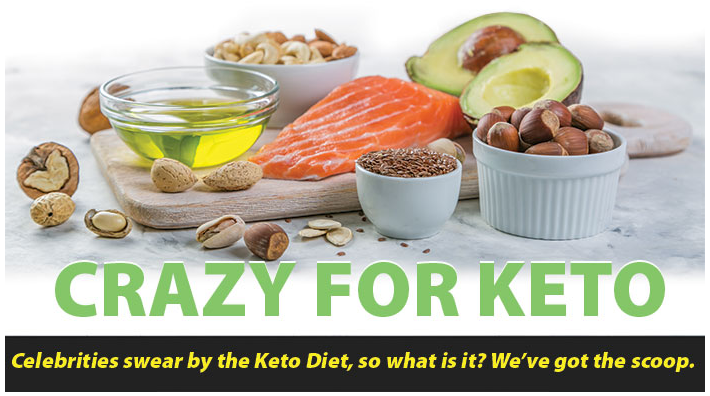 The market is seeing an influx of new products that are designed to ensure success for those who adopt a ketogenic lifestyle. Meal replacement drinks and bars, exogenous ketones, oils and butters all offer the ketogenic dieter a treasure chest of tools to make the lifestyle less complicated and more enjoyable. Meal replacement powders made from healthy fats and proteins can help give the body what it needs for ketosis. MCT oil can be added to coffee to improve mental focus and stave off hunger pangs. MCT is metabolized easily by the body; it’s like eating a complex carb instead of sugar. The body digests and absorbs it easily and uses it as energy efficiently so you won’t get that sugar crash. The gold standard, however, is exogenous ketones. When people get into ketosis, their bodies burn ketone bodies as energy. Nowadays you can buy exogenous ketones as a flavoured (or unflavoured) drink mix and sip on it, to ease into ketosis and alleviate some of those unpleasant symptoms at the outset. Exogenous ketones can also serve as a quality energy source during intensive training. While you’re on the diet, it’s also important to make sure you’re getting your daily recommended dose of vitamins and minerals. Most fruits are high in sugar content. Since you’re restricting fruit while following a keto diet, it is recommended to take a multivitamin that will supply those micro nutrients you might be missing. Fibre supplements can also be beneficial. Whether you’re after a Halle Berry-worthy bod or just trying to avoid spiking energy levels, it’s worth considering the Keto Diet. Just make sure you go in prepared. Many people might not fully understand the ketogenic diet or how to go about it healthfully. Having the right knowledge and supplements will help you see it through so you can enjoy the results you’re after. At Popeye’s®, we make it our job to get you the results you’re after by helping you find the right products, the best products, all at the lowest prices guaranteed. Visit a Popeye’s® Supplements Canada location near you to start achieving your goals!